Acaster's multi-part trip through loopholes, log flumes, and linguistics makes for something other distinct voices may use to branch out from the traditional standup mold. With new live standup sets coming every week, the window of innovation within the current standard hourlong comedy special format is shrinking. Some comedians have turned a niche audience into a special’s raison d’etre, like Fred Armisen, whose “Standup for Drummers” was designed with a certain kind of musician in mind. Netflix itself has played around with its distribution methods, with surprise drops and mini-collections from Dave Chappelle, one of its biggest collaborators. While James Acaster might not have the global name recognition of Chappelle or Chris Rock or Ricky Gervais, his four-part “Repertoire” — available today to stream — is something unique among the Netflix comedy offerings. 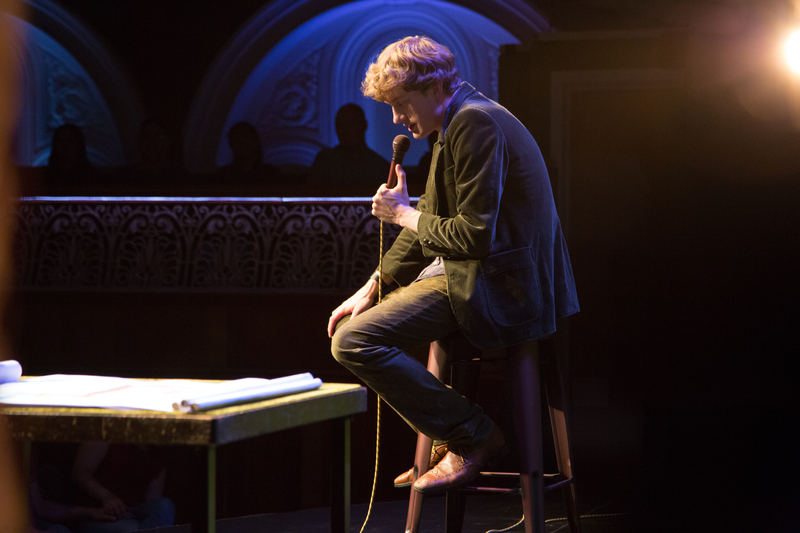 Existing somewhere in an unclassifiable zone between one-man fringe show, stand-up set, and live sketch experiment, “James Acaster: Repertoire” represents the kind of formal trickery that might happen more with Netflix’s slate of offerings as viewers look for something different. Despite the unconventional collection approach, “Repertoire” still has some of the rhythms of standup that audiences might be looking for. With some of the usual goofy observations you’d find from an hourlong set, Acaster wades through some linguistic curiosities, British and otherwise. He delights in the jokes that deal with what English doesn’t have the capacity to express and the weird ways that repurposing certain phrases can be a joke unto themselves. Acaster uses the last word in “Pret a Manger” as a verb and quizzes listeners why we haven’t found an adequate term for those photo-op cutouts you can poke your head through. At one point, he diagrams a nonsense phrase with an audience member like he’s in a funny Noam Chomsky lecture. Aside from that bit of interaction, there’s not a lot of room in “Repertoire” for spontaneity. The timing of pauses, the music cues, and some basic handcrafted props are all finely calibrated. Even the crowd work seems preordained, something that Acaster winks at. This is closer to a theater piece, a solo “Oh Hello” minus the outsized characters and with an extra “u” in humor. Acaster has emerged from the comedy lab and he is here to present the findings of his studies. The individual segments (“Recognise,” “Represent,” “Reset,” and “Recap,” all recorded at The Tabernacle in Notting Hill) are labeled and presented as episodes, not a coincidence for a set of performances that have more connective tissue than you might expect. The different shades of backdrops behind Acaster are more than just a simple visual way to distinguish between the four — the green, red, and yellow signal shades within Acaster’s greater toolbox, ones that he literally combines behind him in “Recap,” the clear standout from these four. It’s not mandatory that all of these be watched in one go, but like its scripted series’ counterparts, there’s a reward for those who can take note of some early throwaway gags. You can’t hold the stage without a very specific kind of physicality, one that Acaster saves for very special occasions. He holds back a handful of fiery rants and bigger emotional swells for times when these specials need a little extra ounce of momentum. The commitment it takes for something like “Kettering Town” — trust us, you’ll remember it when you see it — is the kind of curveball that makes a four-episode investment worth it. This isn’t an enterprise that happens just because someone’s got four hours of wacky observations to share. It’s his stomping/stylophone/praying mantis/geometric drawing methods that make fuel for the journey. Like nearly all sketch shows, there are some hits and misses. A riff on “The Wire” and an extended stretch of “Represent” about him being on a jury are a few cases of diminishing returns the longer they go on. But those are the outliers of a tightly controlled collection built on the kind of laughs that come from catching an audience off-guard rather than guiding them right up to a punchline. Some of Acaster’s best jokes come from a “Jeopardy!”-style inversion, putting the answer before the question. The best part of these is that like any good twist, the flipped punchlines would still work even if the setup played out normally. It’s not just the four-episode arc that takes a new approach, it’s the small-scale pieces that make them up, too. If the traditional standup model is to put you in a comedy club or an arena, “Repertoire” is the closest that Netflix audiences will get to going to something like Edinburgh Fringe, dropping in on something that isn’t funny or noteworthy solely because of the formal liberties it’s taking, but that distinct framing certainly makes it easier to single it out. And it also makes for an interesting tryout of sorts to see if a creator’s voice can translate into something more. Compared with the cost of producing a 10-episode scripted series, giving a comedian a few extra hours to play around within (and occasionally outside) a pre-existing format is the kind of small-scale tinkering that Netflix can and should be benefiting from. If TV shows can be movies and movies can be TV, then this is a glimpse at how a stand-up show can be more than an assembled collection of individual half-hours that can be consumed in any order. Acaster saves some of the satisfying bits for the close of each episode. “Represent” ends with a silent callback, “Reset” with a left-field musical exit-lude, and “Recap” with a short sequence that stays true to the episode title. Like some of his other jokes in the hours before them, they’re surges of electricity designed for the full shock to sink in just after the moment has passed. When audiences finally realize what hit them, it’s an ideal scheme for getting people to come back for more. “James Acaster: Repertoire” is now available to stream on Netflix.